Lenovo's ultraportable ThinkPad X201 isn't the first notebook to upgrade to Intel's new Core i5 and i7 processors, but it's loaded with enough other goodies that it stands out in the growing crowd. The processor's not the only upgrade from ThinkPad X200. The X201 adds a trackpad where before there was only a nub, and adds a 2-megapixel camera with improved low light performance. It also boots up in 20 seconds and shuts down in just five, about a 50% improvement. What's missing? There's no USB 3.0, although you do have 3 USB 2.0 ports to work with, including one powered USB. There's no integrated optical drive, if you care about that sort of thing. You're stuck with Intel's subpar integrated graphics. 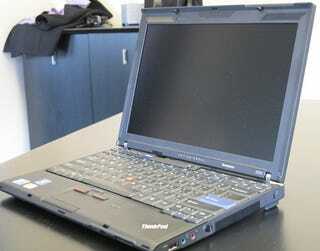 And the X200 features the traditional ThinkPad keyboard instead of incorporating the island-style ThinkPad Edge keys. That's not a downgrade by any means—more just a matter of personal preference.